Knowing I'd regret not having one more chance to see the Quincy Ivory Gull was eating me all week, and so I partnered up with Adam Sell for another go at the bird on Thursday. We arrived at the Art Keller Marina around 8:30 a.m. and quickly bumped into 2-3 birders that had just spotted it. The bird, just like the previous day, was keeping to the roofs of the boat shelters inside the marina. Ivory Gull (adult). Quincy, IL. 08 Jan 2015. There were two open pools of water inside the marina (evidently kept open by built-in aerators under the water), each about 20 ft in diameter. The Ivory would swiftly fly off, circle the marina a few times and then dip down and gracefully pick a small fish from the open water. The wings are much broader than I'd anticipated (something I overlooked with my lifer IVGU). The hand is rather pointy and short (hence a short wing projection when at rest). The legs are very short. The "claws" on its feet were put to use several times to cling to the roof while tearing a fish apart. After a bit of discussion with several people and consulting a few resources, it appears the earlier literature over-exaggerated this species' diet, and one would think that it feeds primarily on carcasses. Although seal carcasses and such are a favored food source, Ivory Gulls also prey on fish and invertebrates as well as lemmings. In fact, Joshua Little and Andrew Aldrich collected a pellet that was regurgitated by this individual. It'll be interesting to see whether the contents of the pellet can be identified. Was it feeding exclusively on fish while in Quincy? 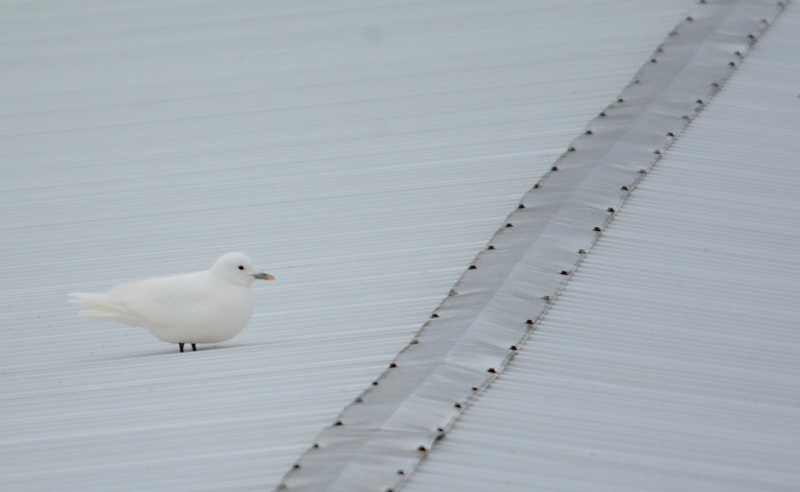 Unfortunately, the Ivory Gull has moved on - last seen on Friday, 09 Jan 2015 (8 days). Many were disappointed on Saturday after an all-day search for the bird was unsuccessful. It appears there were 3 previous Illinois state records of this species (excluding a couple of hypothetical accounts). By my count, this would be the 4th record of this species in Illinois.